Inflammatory Fibroid Polyp Of The Jejunum Presenting As Intussusception: A Case Report And Review Of The Literature. A Klimis, C Chloptsios, F Chrysovergidιs, A Dimitriadi, T Goulopoulos, A Androulaki. Inflammatory Fibroid Polyp Of The Jejunum Presenting As Intussusception: A Case Report And Review Of The Literature.. The Internet Journal of Surgery. 2014 Volume 31 Number 2. Adult intussuseptions are rare entities , almost always associated with a demonstrable lead point. There has been a notable association between adult intussusceptions and inflammatory fibroid polyps(IFPs). These are benign mesenchymal tumor masses, composed of a spindle cell proliferation, accompanied by an inflammatory reaction and variably prominent blood vessels. The histogenesis of these tumors remain controversial, but they are believed to occur in response to local noxious stimuli. Adult intussusception is a rare entity and causes only 1% of all bowel obstruction1. In the small bowel, benign lesions account for ̴70%, with malignant lesions responsible for the remainder2. Inflammatory fibroid polyp (IFP) is a type of non-neoplastic inflammatory pseudotumor that occurs mainly in the gastric antrum or in the ileum, however, they are considered to be very rare in the jejunum and duodenum3. IFP has been reported to cause gastrointestinal bleeding and simple mechanical obstruction, but rarely cause intussusception. Here, we present a rare case of Inflammatory fibroid polyp (IFP) confined to the jejunum presenting as intestinal intussusception in an adult female patient. A 63-year-old female patient presented to the hospital after experiencing colicky abdominal pain, nausea and vomiting that had begun 36 hours earlier. Similar attacks of pain she had experienced time after time over the past four months which had resolved spontaneously. There was no history of prior abdominal operations. Between the episodes the patient reported normal bowel habits. Gastroscopy which had been undertaken previously was found to be normal. 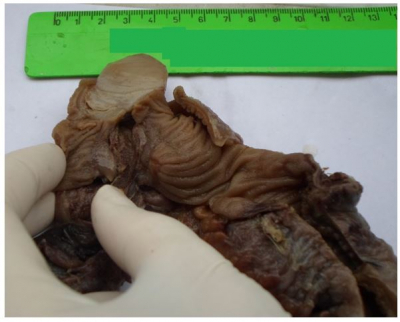 Significant abdominal findings were confined to the abdomen that was distended with mild peri-umbilical tenderness and hyperactive bowel sounds. Digital rectal examination did not reveal the presence of feces, mucus or blood. 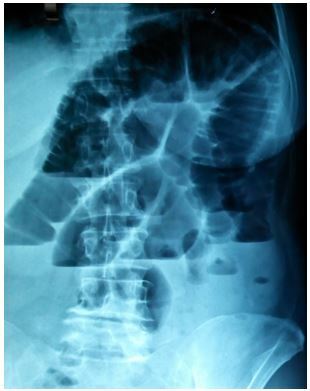 An upright plain abdominal film revealed multiple loops of dilated small bowel in the left upper quadrant of the abdomen(Fig.1). Plain abdominal radiograph showing distended loops of small bowel. Abdominal ultrasonography failed to reveal the intussusception. Computed tomography (CT) was performed and showed a typical “ sausage”-shaped soft tissue mass suggesting small bowel intussusception. Vitals were stable: pulse 78/min, blood 140/80mm Hg, respiratory rate 16/min and temperature normal. Laboratory investigations showed : Urea 22mg/dl(normal: 15-42 mg/dl, creatinine 0.7mg/dl(normal:0.6-1.3mg/dl), SGOT(ALT) 23u/l(normal:5-37u/l), SGPT(AST)52(normal 12-70u/l), Sodium 137mmol/l, potassium 4.4 mmol/l, haemoglobin 10.8g/dl, total leucocyte count 10.8x103/mm3(normal: 4-11.000/l). The clinical symptoms and CT images were consistent with small bowel obstruction. Thus urgent laparotomy with midline incision was performed. On exploration, an intussusception at the jejunum was found 40 cm distal to the duodeno- jejunal flexure(Fig.2), with an intraluminal obstructive mass as a lead point (Fig.3). The small bowel was dilated proximally. 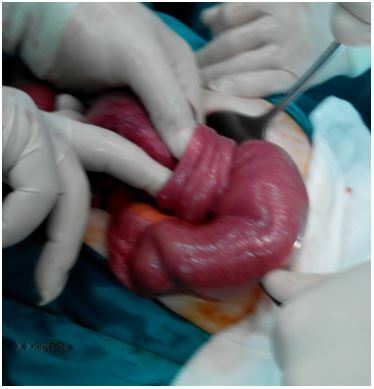 The intussuscepted segment was resected and end-to-end anastomosis was carried out. The resected specimen was sent for histopathology. IFP after section of the S-bowel. Gross pathologic examination of the resected segment of the jejunum revealed a 25x20x15mm sessile polypoid mass, located perpendicular to the plane of mucosa. Sectioning of the lesion revealed a homogeneous, hemorrhagic, tan with glistening surface. Sixteen lymph nodes were present in the attached mesentery. 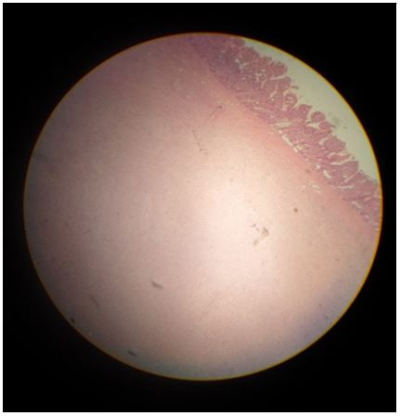 Light microscopic examination showed portion of small bowel containing a submucosal mass(Fig. 4) with extension into the muscularis propria. The overlying mucosa was hemorrhagic with patchy area of ulceration. The mass was composed of a proliferation of spindle-shaped and stellate fibroblasts embedded within loose, oedematous stroma, which contained numerous blood vessels and an abundant inflammatory infiltrate comprising eosinophils, plasma cells and lymphocytes. All resected mesenteric lymph nodes showed reactive changes only. 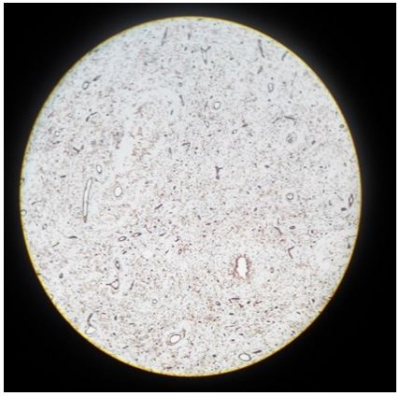 Histological appearance of IFP(H-E stain, original maginification x100). The primary diagnoses were doubted between gastro-intestinal stromal tumor(GIST) and inflammatory fibroid polyp. Immunohistochemical study was done on the specimen. The spindle cells were negative for CD117(C-kit), smooth muscle actin, desmin and S-100. Vimentin, fascin and cyclin D1 were strongly and diffusely positive. CD34 highlighted the vascular supply, although some of the spindle cells located between vessels were positive (Fig. 5). Positive Immunostaining of spindle cells and vascular supply for CD 34(Immuno- histochemical stain, original maginificationx100). The differential diagnosis also included neural and smooth muscle tumors. Immunohistochemistry performed on this lesion was negative for S100 and desmin, excluding a neurogenic and smooth muscle tumors. A final diagnosis of an inflammatory fibroid polyp of the jejunum was made. The patient had an uneventful post-operative recovery, and was discharged 7 days after surgery . Six months after the surgery she remained well and symptom free. Intussusception is a rare condition in adults, but can be the first manifestation of a tumor. It represents only 1% of all cases of intestinal obstructions in adults.1,2,3 The jejunum is the least likely location for intussusceptions to occur because the leading pathology is rare at this location of the gastrointestinal tract4,5,6,7. A jejuno-jejunal intussusception resulting from an IFP was first described by Winkler et al. in 1986.4 Since then, to the best of our knowledge, about 17 cases of jejunal IFPs, producing intussusception , have been described 2,4,5,6,7,8,9,10,11,12,13. IFPs can affect any portion of the GI tract, but they are most common in the gastric antrum (70%) and the terminal ileum(20%), but rarely in the jejunum. Akbulut et al.13 reported that among 85 patients with IFPs of the small bowel ileal intussusception was found in 63 patients and 17 had jejunal, three had colonic and two had ileojejunal intussusception. IFPs affect both sexes and all ages, with peak incidence in the fifth and sixth decades. This is likely because the lesions produce local symptoms that are size dependent. The exact aetiology and pathogenesis of IFPs has not yet been clarified. Most regard IFPs as a reactive or inflammatory process in response to local noxious stimuli, with incomplete differentiation of myofibroblasts and primitive submucosal stromal cells14,15. An allergic aetiology has been proposed due to the association with eosinophils10. Immunohistochemical study with positive expression of spindle shaped cells with CD34 favor the hypothesis that IFPs represent a reactive proliferation of primitive perivascular/vascular cells14. Macroscopically, IFPs tend to appear as solitary polyps, that are well-circumscribed. Larger lesions may be pedunculated, and the mucosal surface is often ulcerated on its apex. Size up to 18 cm in the largest dimension has been reported9. Histologically, the epicenter of the tumor is usually in the submucosa, but it can infiltrate into the overlying mucosa and the muscularis propria or serosa 6,10,11. The microscopic picture entails a loosely arranged fibroconnective tissue with a prominent thin-walled vascular component and an inflammatory response dominated by eosinophils. Cellular atypia and significant numbers of mitoses are not seen. The GIST is an important consideration in the histological differential diagnosis of IFPs. In morphological ambiguous cases, immunohistochemistry is helpful to make a distinction between the two entities. Both tumors are positive for CD34 and Vimentin, but GISTs are positive for CD117(c-kit),while IFPs are not5,10,15. Negative staining to S-100 protein distinguishes an IFP from a neurogenic tumors which are positive for this marker. Some cases of IFPs fail to show positive staining for CD34, and this may be related to the evolution of the tumor14,16. Many IFPs are asymptomatic , and are typically identified during endoscopy or laparotomy. When symptomatic, the clinical picture depends on the size of the tumor and on the location. Most of the jejunal IFPs have been found to cause small bowel obstruction as a result of intussusception3,4,,5,6,7,9. If the overlying mucosa ulcerates then GI bleeding, anaemia and alteration of bowel habits were occasionally. Small bowel lesions are not usually diagnosed pre-operatively because they present with vague symptoms of bowel obstruction due to intussusception. Laboratory investigations and plain radiographs are not helpful in making the diagnosis as they will demonstrate nonspecific findings that are more in keeping with bowel obstruction. Abdominal CT scanning, is currently the diagnostic instrument of choise17,allowing in some series a correct preoperative diagnosis in up to 80% of the cases1. The CT appearance is complex. According to the cut axis, the intussusception appears as a “sausage” or a “ target” mass. There are no unique identifying features on imaging that can distinguish the nature of the lead point. The absence of pathognomonic clinical or radiological features makes operative resection and microscopic examination of the resected lesion mandatory. Operative resection of the involved intestine with free margins is sufficient treatment. In conclusion, IFP is a rare benign cause of enteric intussusception in adults. This diagnosis should be considered by Surgeons when intussusceptions are encountered in adults. 1. Azar T, Berger DL. Adult intussusception. Ann. Surg 1997;226:134-138. 3. Toso C, Erne M, Lenzlinger Ph.M et al. Intussusception as a cause of bowel obstruction in adults. Swiss Med.WKLY 2005;135:87-90. 4. Winkler H, Zelikovski A, Gutman H. et al. Inflammatory fibroid polyp of the jejunum causing intussusception. Am J Gastroenterol 1986;81:598-601. 5. Jacobs TM & Lambrianides AL. Inflammatory fibroid polyp presenting as intussusception. J Surg Case rep 2013 (2). 7. Cawich S, Gibson T, Mitchel D. et al. Adult intussusception from an inflammatory fibroid polyp: A case report and review of the literature. Inter Jour Path 2007;7:1. 8. Kim JS, Kwon SY, Byun KS et al. Kor Jour Inter Med 1994;9:51-54. 9. Neishaboori H, Maleki I, Emadian O. Jejunal intussusception caused by a huge Vanek’s tumor : a case report. Gastroenterol & Hepatol 2013;6(4):210-213. 10. Patel A, James A, Thomas D.M. Inflammatory fibroid polyp causing jejuno-jejunal intussusception. Gastroenterol Today 2008;18:87-91. 11. Vijayaraghavan R, Sujatha Y, Santosh KV et al. Inflammatory fibroid polyp of jejunum causing jejuno-jejunal intussusception. Indian J Gastroenterol 2004;23:190-2. 12. El Hajji II, Sharara AL. Jejuno-jejunal intussusception caused by an inflammatory fibroid polyp: Case report and review of the literature. J Med Liban 2007;55:108-111. 13. Αkbulut S. Intussusception due to inflammatory fibroid polyp: A case report and comprehensive literature review. World J Gastroenterol 2012;58:5745-5752. 14. Wille P & Borchard F. Fibroid polyps of intestinal tract are inflammatory reactive proliferations of CD34-positive perivascular cells. Histopathol 1998;32:498-502. 15. Pantanowits L, Antonioli D, Pinkus GS et al. Inflammatory fibroid polyps of the gastrointestinal tract. Evidence for a dentritic cell origin. Am J Surg Pathol 2004;28:107-114. 16. Ozolek JA, Sasatorni E, Swalski PA, et al. Inflammatory fibroid polyp of the GI tract: clinical, pathologic, and characteristics. Appl. Immunohistochem Mol Morphol 2004;12:59-66. 17. Gayer G, Zissin R, Apter S et al. Adult intussusception- a CT diagnosis. Brit J Rad 2002;75:185-190.